eRevMax, the leading hotel online distribution and business intelligence solution provider has announced the results of its 2014 Annual Customer Satisfaction Survey, showing increased levels of satisfaction for key parameters including support, training, reliability and overall product reliability. The results show that 90% of the customers who took part in the survey think eRevMax solutions is reliable and provides accurate and up-to-date information. The eRevMax customer survey was conducted with RateTiger and Connect users across the world assessing performance with regards to product delivery, product performance and quality of services. In its third annual customer survey, the results indicate that 88% of RateTiger customers are happy with the usability, while for Connect customers, all respondents agree (100%) that the enterprise connectivity solution is easy to use. eRevMax COO Greg Berman said: "The survey is important to gain an objective perspective on all aspects of the business. "The findings are an instrumental guide for our strategy. We continue to work on of our mission of providing customers with the best technology supported by exceptional service and training to remove the complexity out of their eDistrbution business. "The result only deepens our commitment to helping hotels improve their channel management, competitive positioning as well as optimise revenue." Service delivery: 86% of RateTiger customers are satisfied with the service delivery cycle time, while 90% of Connect users think the time taken to resolve issues meets their expectation. Training category: In the training category, Connect users gave a ten on ten while 86% of RateTiger customers said they received the level of training needed to help them improve channel optimisation of OTAs through its integrated channel manager. 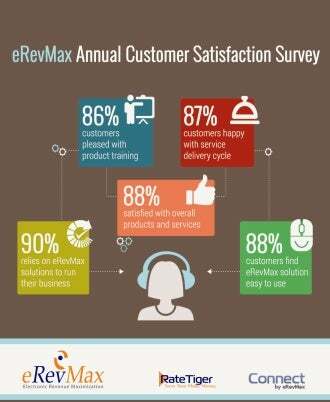 The annual eRevMax Customer Satisfaction Study was conducted in August and received responses from more than 500 users. The latest survey results emphatically reiterate an upward trend for the company’s products, solutions and services as compared against the same survey completed in September 2013. Image: eRevMax solutions is reliable and provides accurate and up-to-date information, according to 90% of customers surveyed. Photo: courtesy of eRevMax.